On December 26th, 2011 I would sit in a pre-op room with my daughter on my lap while another mother sat just a few rooms down with a daughter of her own. Moments later a friend would walk into our room to pray for Izzy’s first of many surgeries. She would tell a story about a woman she had met in a doctor’s office earlier in the week (I believe that’s when – it’s been a while ;)). They had discovered they were both headed to Riley Day Surgery on this day to visit little girls with Neuroblastoma that were scheduled for surgery at the same time. Chills covered my arms as she told the story. She actually saw the women in another room and stopped in to prayfor them as well. She prayed for their family and most importantly their brave little warrior named Henley. Our friend would leave shortly and I would continue on with what I thought was the longest day of my life, little did I know it would not even come close. Several hours later in the waiting room I would see this family of Henley’s and I would meet the mother for the first and only time. While our own journey was still just a few days old and our prognosis quite ‘simple’ their journey seemed as though it had been a lifetime and Henley’s prognosis seemed very complex. I learned they were taking Henley to the other side of the country for her care and quickly discovered that sometimes that’s what had to be done when the life of your child was at stake. I also learned they had a son Carter’s age and I began to see that cancer was more cruel than I had ever known. In the brief time we talked I saw such pain on the mother’s face, which was not surprising. What was, however, surprising was what I saw within in her eyes. Within her eyes I saw strength. I saw an unstoppable willingness to fight. And what struck me most was that I saw compassion. She embraced me with tears streaming down her face. Genuine tears that said, “I am so sorry for the journey you are about to begin.” A journey only she could know. Inspite of her own pain, she was clothed in the love of God so deeply that I could tangibly feel it within her embrace. There are so few Neuroblastoma families that I have met along this journey that I have now come to believe God was truly speaking to me by allowing us to be in that waiting room at the same time. It was His way of letting me know that He would never leave us alone on this journey, a word He has been true to uphold. I have had little contact with this family over the past two years but have followed Henley’s story closely. This past July sweet Henley Hazel was called Home. Such is the reality far too often with these brave warriors. As parents of warriors we walk in that reality daily, but I cannot imagine the new reality these parents now live in. It is a reality that knows their daughter will never suffer again, sure. But it is a new reality, often empty I would presume, that must be entirely redifined without a person whose defintion they never want to lose. It is a reality no parent should ever be forced to walk in, yet many are. My heart is broken for them and I have not known what to do. What could I possibly do, me who still has a daughter that is alive? I look at Izzy and I wonder what I would possibly want from the world if she was taken. I decide it would only be for her to be remembered. For her to still be known. Is it not better to have lived a life of 4 or 5 years that had impact on this world than to have lived a life of 100 that had none? January 15th would have been Henley’s 5th birthday. The first birthday after her passing, a day most uncomprehensible for any parent. The Romines asked for anyone Henley’s life touched to take a picture of themselves holding a lit candle and send it to them or post it on Facebook. When they did this I knew I was to tell Izzy about Henley. That would be my contribution to her life, to tell my own daughter that she existed. Now you must understand that this was a big deal because Izzy did not know that a person could die from cancer. I knew that talking to her about Henley would not be a small task but would definitely be one worthwhile. “She died this past summer.” Instantly her face sank. She looked at the picture harder now, confused by my words. Her mind was beginning to put two and two together. “But, she doesn’t have any hair,” she said, sort of asking a question. “No, she doesn’t. She had cancer, babe,” I told her. I could feel my eyes and the corners of my mouth get softer. She was looking more worried and I could tell she either wanted to throw up or cry. “Well, babe, she had cancer,” I started to get nervous and was kind of hoping I wouldn’t have to actually say the words I had been deliberately avoiding for so long. “But HOW did she die?” Okay, I was going to have to say the words. I cringed as I opened my mouth, “Babe… sometimes people die when they have cancer.” She looked up at me quickly from the picture. She was horrified. I could tell there were a million things running through her mind. She was putting together so many pieces, so quickly. “Didn’t she go to the hospital? Didn’t her parents pray for her?” Like our adult minds, her five year old one did not understand why none of that worked. “No. There is no cancer in heaven.” And as I said it there was a shift. Her eyes lit up. A small smile came to her face and as the thought sunk in a little deeper it grew. “Never, ever. She’s an angel now. She’s dancing with Jesus and all the other angels,” I told her and went on to explain how she would never be sad there and could see her mom and dad and brother whenever she wanted. “Does she have wings?,” she asked, starting to get all dreamy eyed. “I wish I could go to heaven and be an angel like Henley too,” she said, hands clasped together at her chest as she twirled around. Her words pierced my heart to it’s core. “It’s not your turn to go there, Izzy,” I said, clearing my throat. “Someday it will be, but for now God wants you here.” She began to twirl around the room in the depths of her own imagination. After I pulled myself together, she gladly took the picture with the candle for Henley’s birthday. Henley was, afterall, a hero to Izzy now. 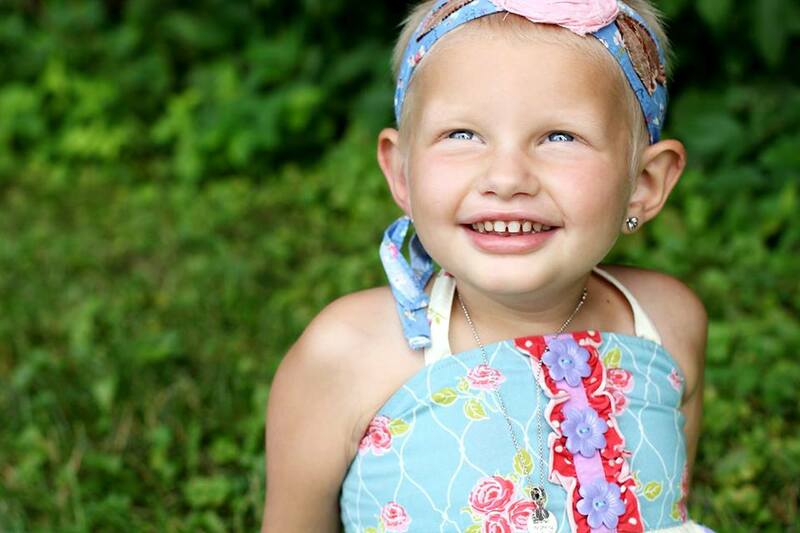 She was a beautiful angel with wings who could never get cancer again. To Izzy that was far more impressive than any super power or any princess crown. The reality is, this journey is a walking horror. It’s either about watching kids suffer or walking in constant fear while you carry around bags of pain and trauma. Admittedly, I have not always done the best job while on it. But this is what I’m learning: redemption is a long process. God can surely redeem anything but most of the time it does not happen overnight. It takes weeks, months, sometimes even years. I don’t know what total redemption will look like for us at the end of this journey. My prayer, ofcourse, is that we are in the beginnings of seeing it. But I’m still waiting. I’m stuck in a place that wavers between thanksgiving and fear. What’s going to happen Lord? What’s going to happen? But I also know redemption doesn’t look neat and pretty at the end of this journey for everybody and I never want to forget that. I don’t say that from a place of, ‘better watch out’ but rather from a place of, ‘don’t forget those around you that have lost more.’ I don’t ever want to be so caught up in my own fear and pain that I can’t see it in someone else. A long time ago I said that I believe “from whom much is taken, much will be restored.” That’s alot easier to say when you’re just talking about time or security that was taken. But what about when your talking about a person? I still believe it. I believe with my whole heart that somehow the Lord will redeem this broken mess for the Romines. I won’t pretend to know what that could look like but that won’t stop me for asking for it. For declaring it. You know, the truth is, I never wanted to tell Izzy that cancer could take someone’s life because for me that was the worst case scenario. It never occurred to me, however, that it might not be the worst case scario for her. I’ve never been a tiny child whose spent years fighting so I never knew that the worst case scenario could be living your life fighting again and again, even if she doesn’t have the words to articulate all that. 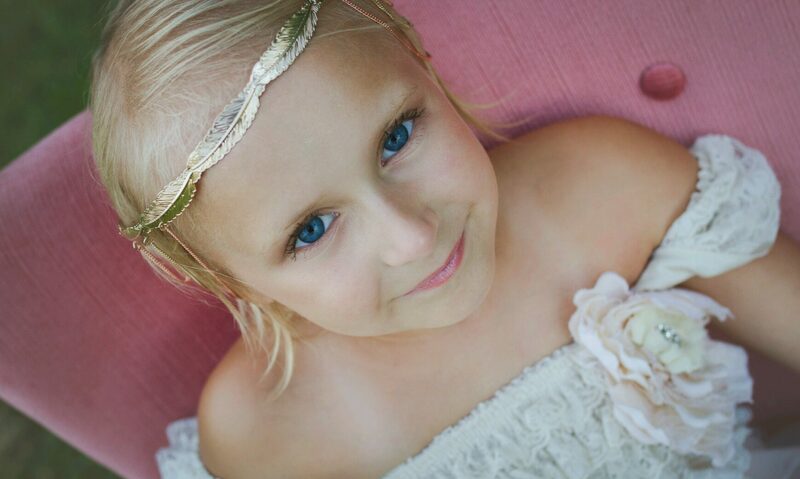 Sure the angel wings are nice, but you know why heaven is such a beautiful place for Izzy? It’s not because kids can’t get cancer there. It’s because CANCER can’t get KIDS there. And that’s why Izzy instantly latched on to the freedom she heard Henley had. Such sweet, beautiful, heart breaking, freedom. Though Henley is free now, I doubt her parents or her seven year old brother share in that freedom on a daily basis. Will you join me today in asking for freedom for them? A freedom that moves forward with hope, though never lets go of Henley’s memory. Today I ask for redemption for the Romine family. I ask the Lord to surround their family with favor and supernatural peace and to embrace them with a commitment to restoration. Blessings to you today, LIFE for IZZY and REDEMPTION for the ROMINES. ** The Romines are doing alot of work in Henley’s honor to love kids well who are fighting cancer. To find out information about all that they’re doing or ways that you can help the Henley Romine Beelieve Foundation, visit: www.bravebee.org. Your comments sure hit home, but beautifully written. We waited quite sometime to tell Rylee about her best hospital buddy that lost her battle to cancer. Why-because like Izzy, she didn’t realize cancer could kill kids. When -a couple of years later- we had to tell her that her great grandma had passed away, Rylee’s first words were “I bet Grandma is in heaven making “mokey links” for Talia. Brought on the tears, but realized Rylee could see the beauty of Heaven. We had another issue about a year later when a lady who had babysat with Rylee was diagnosed with cancer and Rylee sobbed because she was sure it was her fault-that she had given another person cancer. Again, we were blessed because these wonderful people held Rylee close and explained it was in no way anything she did. On that day, (as if I needed a reminder) I remembered again how much I hate what childhood cancer robs from these beautiful children. God bless your entire family and enjoy every day. We are blessed. So beautifully put. I pray for that freedom for the Romines and the redemption. Peace to you all who have to face this horrible battle. Such a sweet and heartbreaking post. Thank you for taking time to pay tribute to Henley and to assure her parents that she will never be forgotten. It is a parent’s 2nd worst fear, only after living through the 1st. What a really beautifully written piece…Henley’s life has touched so may people all around the world. Thank you for your part in paying her story forward! Prayers for life, redemption, and God’s presence always.